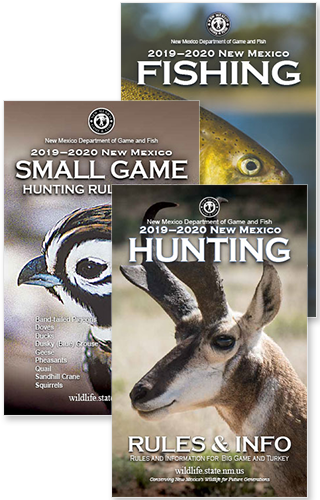 Click the tab headings below to learn more about Training/Safety Permits, information about Game & Fish Safety Classes, available third-party Online Training, and Public Outreach offered by the Department. New Mexico law requires anyone younger than 18 operating an OHV on public lands or any ATV or ROV on authorized paved roads to possess an OHV safety permit during use. OHV safety permits are not machine-specific (for instance, a safety permit from an ATV class is acceptable for dirt bike operation). However, because the physical skills required for safe operation differ from one type of OHV to another, we recommend taking a safety class for the type of machine to be operated. The Department offers free hands-on ATV and dirt bike training that provides the OHV safety permit required for public land or paved road operation. Program ATVs and dirt bikes are available for students lacking access to appropriately-sized machines. Program machines are reserved on a first-come, first-served basis during course pre-registration. Students may use privately owned machines that are registered in accordance with state law, meet age-specific size-fit rules, and pass a pre-ride inspection conducted by the class instructor. » Click here to pre-register using the New Mexico Online License System for a scheduled safety class. » Click OHV Safety Class Pre-registration Instructions to download instructions for class pre-registration. » Contact the OHV program office for information about other classes not yet scheduled. Online training is also available that provides the required safety permit after completion. Click on the Online Training tab to select online training options. Online training vendors charge a fee to issue a safety training permit. Rules for Off-Highway Vehicle Program Safety Training classes. Thank you for registering for off-highway vehicle (OHV) safety training provided free of charge by the New Mexico Department of Game and Fish Off-Highway Vehicle Program. Please make note of the class date, location, and times during the registration process. You may change or cancel your class registration until 5:00 pm of the Thursday before a weekend class. Changes after that time require assistance from the OHV Program office. A parent or guardian of each student under 18 must remain on-site during the entire class. Make note of class start and stop times. Please report to the class at least one half-hour early. Each student MUST HAVE a mechanically sound OHV for use during class. Motorcycle classes require motorcycles. ATV classes require ATVs. No sharing of vehicles is allowed. All vehicles must be currently registered according to NM state law. Department training machines are available for use during ATV and off-highway motorcycle classes – request a machine during the registration process in the ‘Special Needs’ dialog box and call 505-222-4712 to confirm reservation. Students 16 years of age or older may ride ATVs with engines of any displacement. Students between 10 and 15 years of age may only ride ATVs with engines up to 250cc, unless the student holds a current automobile or street motorcycle operator’s license or instructional permit, in which case they may ride ATVs with engines up to 450cc. Students younger than 10 years of age may only ride ATVs with engines up to 110cc. All vehicles must be equipped with a US Forest Service-approved spark arrester. Unmodified OHVs not intended for closed-course competition usually comply with US Forest Service requirements. Competition OHVs can be equipped with aftermarket spark arrester silencers sold by dealers. Check for the embossed printing on the muffler or check your owner’s manual, contact your dealer, a Forest Service office, or the OHV Program office for more information. A DOT- or ECE-approved helmet (look for the DOT or ECE sticker on the back or inside the helmet). Eye protection such as goggles, safety glasses, or a faceshield properly attached to the helmet. Sturdy boots or shoes that cover the ankles, full-fingered gloves, long pants and a long-sleeved shirt or jacket. Students should dress appropriately for the anticipated weather. 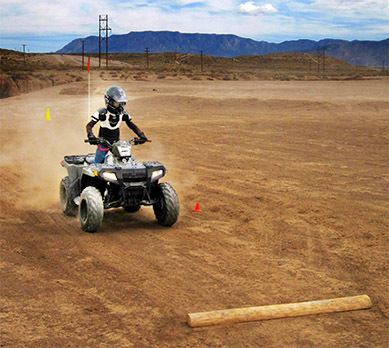 OHV program safety equipment is available in limited sizes for use during class. Failure to be on time or to provide the appropriate vehicle, safety equipment, or adult supervision may result in dismissal from the class. ALL INSTRUCTOR DECISIONS REGARDING STUDENT PARTICIPATION ARE FINAL. • Time Limit: Student must complete entire course before taking exam. • Student must receive passing score to receive a certificate. • To get a copy of your card, please call: 1-800-776-7620. • To get a copy of your card, please call: 1-800-830-2268. • To get a copy of your card, please call: 1-877-508-4288. • To get a copy of your card, please call: 1-866-499-7669. • The Recreational OHV Association (ROHVA) E-course does NOT include New Mexico-specific information required by NM law. • Access to the ROHVA E-course is provided here as a courtesy to New Mexico OHV operators needing online training specific to the ROV/UTV/SxS type of off-highway vehicle. The New Mexico Department of Game & Fish OHV Program offers public outreach activities for organizations and events free of charge. Typical organizations are schools, outdoor recreation/sportsman groups, and public health organizations. Typical events are safety days, outdoor expos, and any other event reaching our target demographic audience. Our target audience includes adults and youth age 6 and older who engage in OHV recreation or who use OHVs as part of a rural or agricultural lifestyle. Our primary public outreach activity is an ATV simulator presentation targeting kids from six to about twelve years of age. We offer a quick OHV safety message emphasizing the need for protective gear, parental supervision, and basic physical skills training, capped by a turn aboard our youth model ATV simulator. Participants are closely supervised, and parent/guardian presence is required. Teachers or school staff can serve as guardians during school presentations. Participants receive souvenir age-appropriate promotional items as available. We can also offer our promotional items in other settings. For more information please contact the OHV Education Coordinator at 505-222-4712 or via email at DGF-OHVEDU@state.nm.us.